www.Terrorizer.com - View topic - Best recent Big 4 album? Best recent Big 4 album? The Anthrax sounds like a good AOR album at times. Re: Best recent Big 4 album? 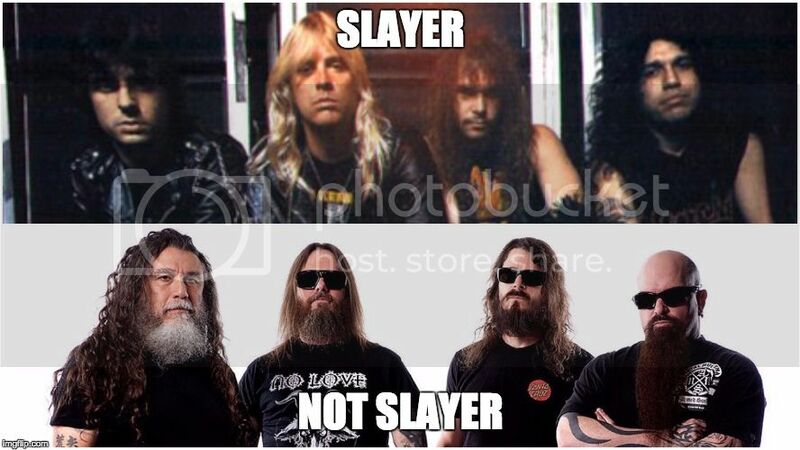 You got the last Slayer album wrong. The last Slayer album was of course World Painted Blood. Not that any of them are particularly good, obviously. The albums all good bar the odd song but I will wait until I listen to the actual Metallica CD (not YT) ! Last edited by blacklorre on Mon Nov 21, 2016 3:56 pm, edited 1 time in total. You made this poll but haven't listened to all of the listed albums? Does watching the Metallica videos in random order count? I have it on order from the library. Not even excited by that. More of a 'I have listened to it' thing. It's probably a better way to listen to it. At least there would be something to look forward to, in trying to figure out what order those turds are coming flying at you. Admittedly haven't heard Megadeth or Anthrax but Repentless is just mindlessly dull. It's ten times better than the Anthrax. That said, I can't remember a note from either of those two, or the Megadeth (which I remember thinking was alright at the time) so none is worth bothering with, really. what order those turds are coming flying at you. Beginning to like those turds! Did you actually read what you wrote before you posted that?